An indie platformer with time based mechanics and puzzles. Most people would assume I'm talking about Braid with a description like that. We're on the right track, but mix in a touch of steampunk, multiple character control and a large, metal shelled snail, and you've got Chronology. This indie title just released via Steam Greenlight may sound similar to games like Braid, but it handles time a bit differently. Things look great! Surely this structure is safe in the future. You play as the aptly named Old Inventor (think of a Victorian, gnomish Doc Brown) who is working backwards to prevent a catastrophe he's already lived through once. You hold a time device that allows you to shift between two points in time (one before the incident, one after). The puzzles presented are clever, often involving more than reflexes to complete. 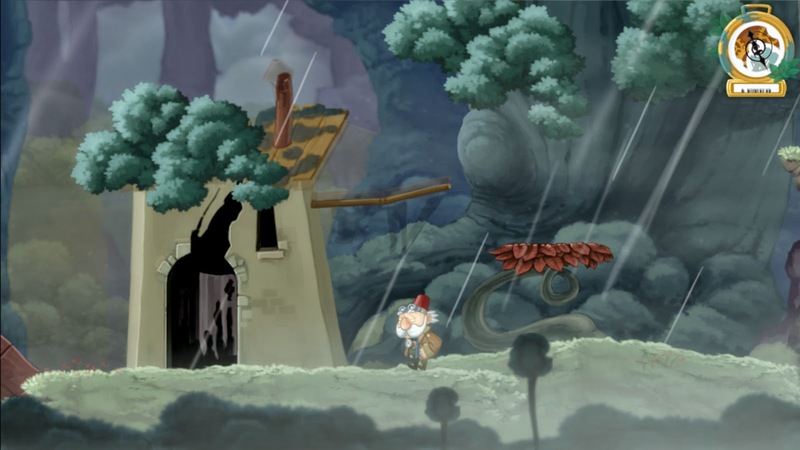 For example, several early puzzles rely on replanting young trees in the past in order to use their branches as platforms in the future. Chronology's art really shines in the shift between past and future. The color palette shifts from spring to fall, buildings collapse, plants wither or grow and machinery collapses and rusts. The hand-drawn technique again brings shades of Braid to mind, with the overall lighthearted atmosphere the notable exception to the comparison. Not far into the game, you are joined by an adorable snail. Apart from being able to climb almost any surface, he can also stop time. 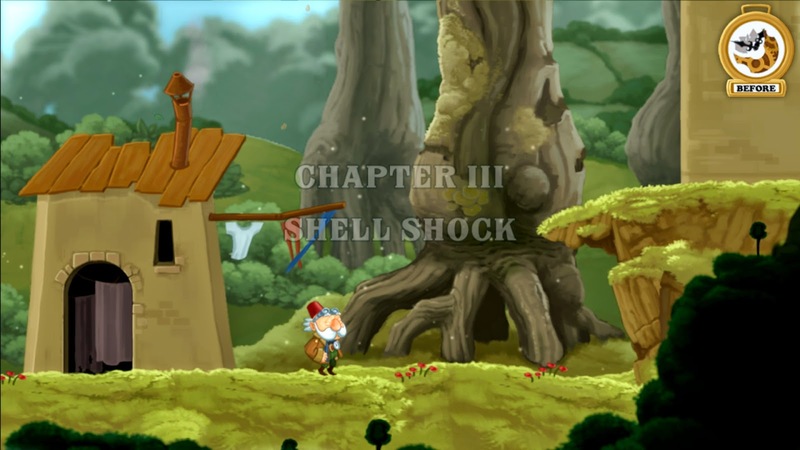 The snail's abilities are quickly put to good use, allowing the player to access fast moving platforms and navigate gauntlets with relative ease. These later puzzles, while certainly more difficult than those before them, managing the controls is the biggest hurdle. The game was clearly designed to be best experienced with a controller rather than mouse or keyboard. Control issues aside, moving back and forth in time while manipulating objects in the environment is really fun. There is plenty of room for experimentation but only ever one solution to a problem. In many games, the leap from experiment to solution can be incredibly frustrating, especially when the solution is contrived or nonsensical. 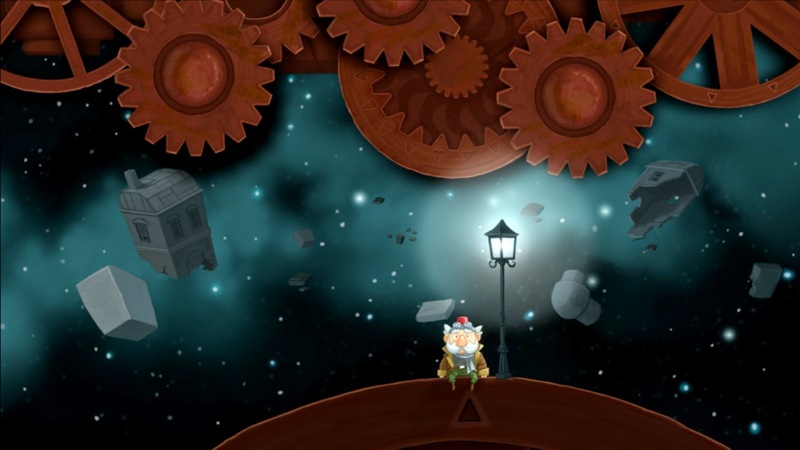 Chronology's puzzles feel organic and logical. As a result, the inevitable failures are much less frustrating. Chronology is a fun, light exploration of some very interesting mechanics. The game is short, playable in a single afternoon. It's a novel approach to time travel mechanics, beautifully illustrated and thoroughly enjoyable, even during its most frustrating puzzles. Chronology is currently available for PC on Steam.